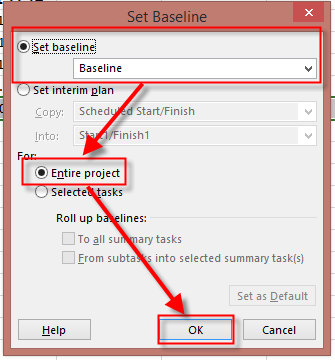 After we update the progress (% Complete) on various tasks on a baselined project, I understand we need to re-schedule the uncompleted work to start after the status date. This is required to prevent the ambiguity of certain tasks with 0% progress to start earlier than the status date. 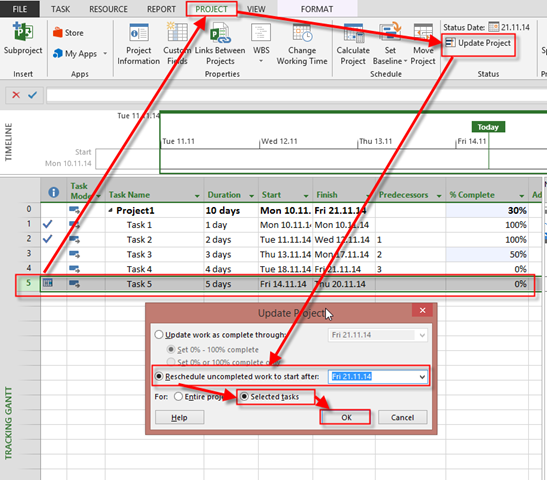 The Re-schedule uncompleted work button under Update project in MS Project has two options Entire Project or Selected Tasks. Please clarify when to use which of the options. Also when we hit the re-schedule button , the Schedule Start date for the tasks with 0% progress moves to a date later to Status Date and a SNET date constraint is imposed. Moving forward, do we need to retain the SNET constraints? My understanding is, we need to remove the SNET constraints by adding lags to the predecessors and match with the SNET dates. I feel this is essential to obtain an accurate critical path as any date constraints imposed on the tasks may hamper an accurate critical path. Task 4, and Task 5 are moved as well. Task 4, and Task 5 have new Start no earlier than Constraint which is now Friday, 21.11.2014 (Status Date). You can remove them if you don’t need them. And it works as it should be. As you can see only Task 5 is rescheduled. So use Selected Tasks only when you know that those Tasks should be rescheduled. 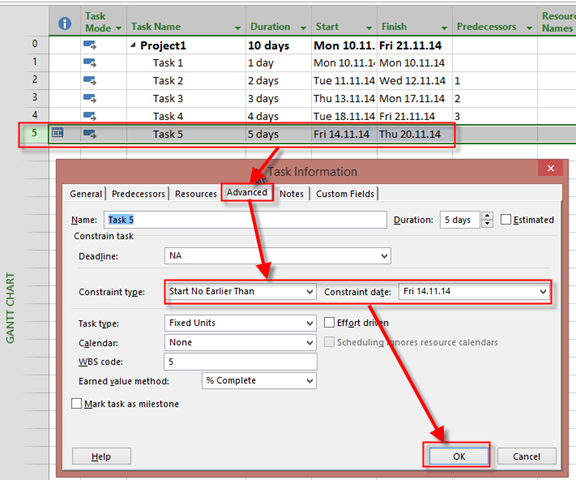 If your Project is up to date with Actual % Complete, and you want to have Realistic Schedule, Reschedule the whole Project! This entry was posted in MICROSOFT PROJECT, Microsoft PRoject 2010, Microsoft Project 2013, MS PROJECT 2010, PRoject Management and tagged Microsoft Project 2010, Microsoft Project 2013, Microsoft Project 2013 - Scheduling. Bookmark the permalink. Long Time since we chatted. How are you?